Everything looks quiet in the bay but at a side dock a strange bustle is catching the eye. A group of men in uniforms seems to have appeared from nothing with tiny long skiffs, different color flags, sundry equipments and supplies. 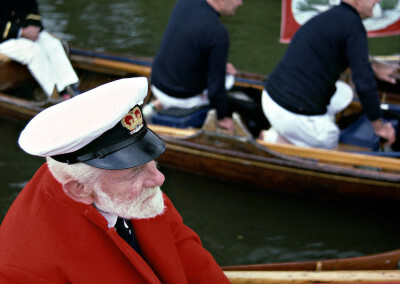 When everything seems to be ready, the men get on the boats, take up the oars and off they go in the most complete anonymity. 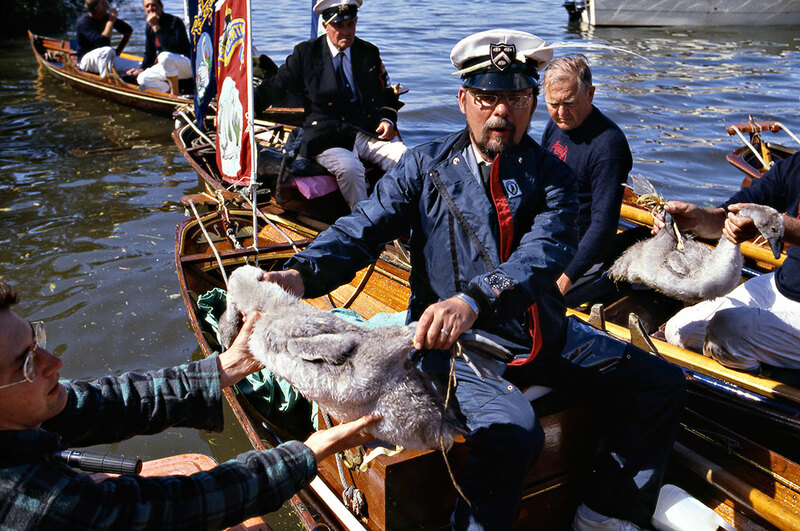 This has happened every year since medieval times: the Swan Upping, a very important and precise Royal mission. 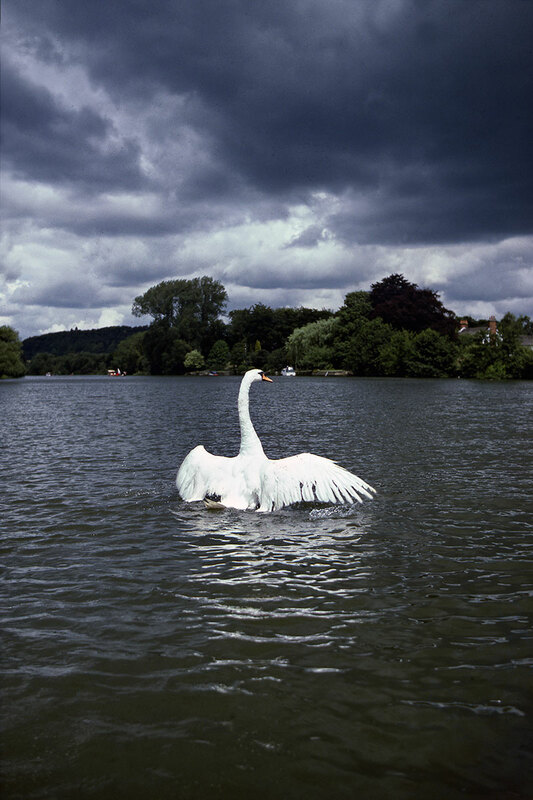 The object of the mission is the swan which was (and still is) considered a Royal bird. 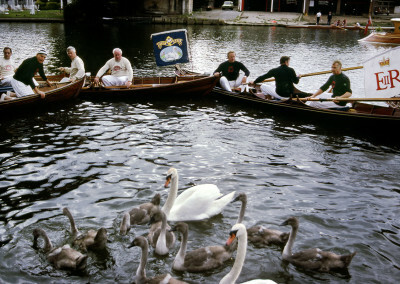 As mentioned above this event has its roots in the 15th century (1483, under the rule of King Edward IV) when it was decreed that only the Monarch could possess swans. 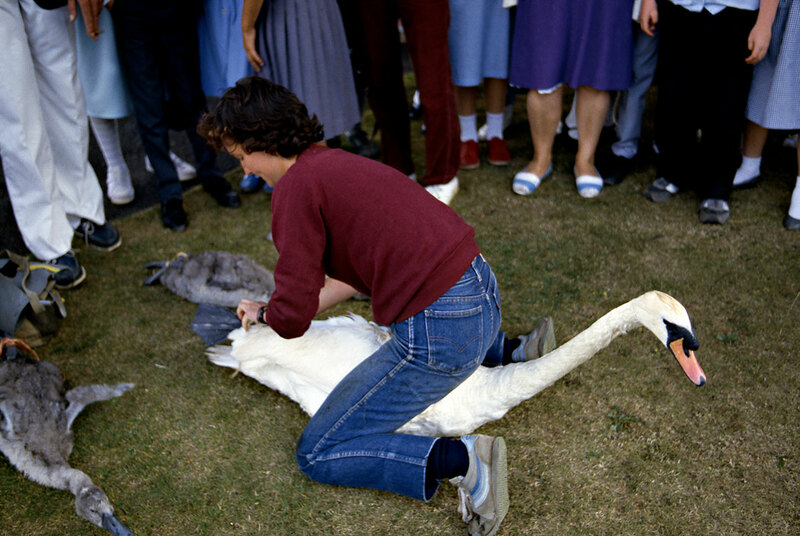 This to prevent and punish persons of little reputation who had stolen cygnets or swan eggs. 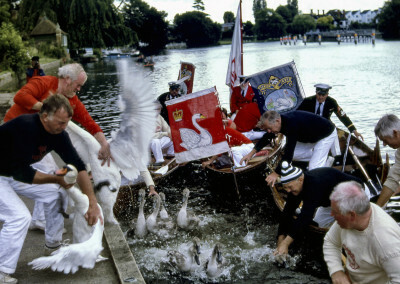 The Crown could though give the privilege of a “game” of swans to those who were possessors of freehold land or property to the annual rental value of 5 Marks; a Royal gesture towards the encouragement of trade. 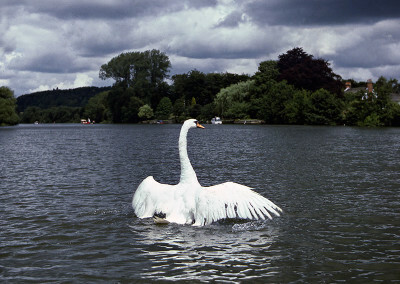 For centuries the Thames swans were regarded, not only as decorative in a majestic way, but as a delicacy at Royal feasts, while swan feathers were used for palace upholstery. At the same time it was ordered that on every river in the kingdom all the swans were to be counted, examined and recorded each year. Ever since these privileges were granted it has been necessary to mark the swans of the Crown and of the other livery companies so that their ownership could be easily recognised. 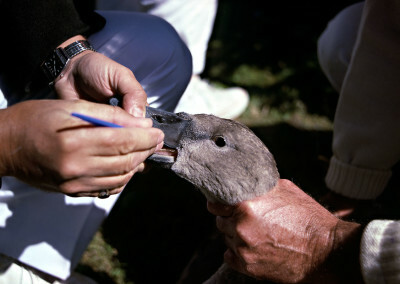 King Henry VIII instituted the marking of cygnets with nicks on their beaks with the proviso that any bird not so marked became Crown property. Queen Elizabeth I supported these injunctions and ordered that those who erased or counterfeited any owner’s mark should be imprisoned for a year. The marks were nearly always in the upper mandible and mostly of complicated design. Nowdays on the Thames all the swans belong either to the sovereign or two City Livery Companies: the Dyers and the Vintners. The Dyers’ privilege is said to go back to 1483 and the Vintners have for certain exercised their privilege since 1510. 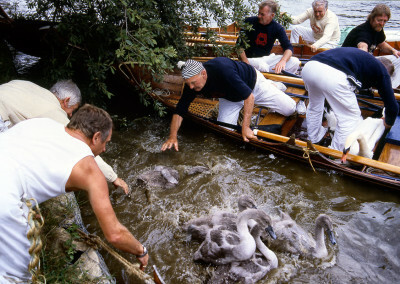 Thus every July the Swan Upping voyage takes place with the three Swan Masters an their crews: the Queen’s, the Dyers’ and the Vintners’. 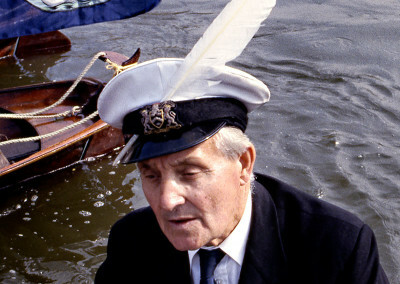 The Royal Swan Master is the official Queen’s Keeper of the Swans, a title which has been handed down for generations. Special Uniforms are worn for the occasion. 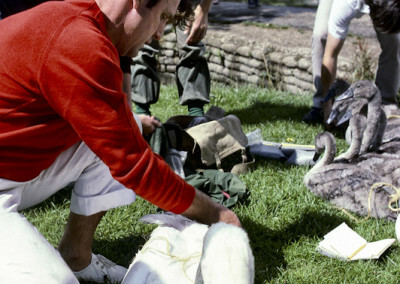 Her Majesty’s Swan Keeper uniform has a scarlet jacket with brass buttons and white trousers, a peaked cap with a white top and a Royal Crown as a badge on the cap. 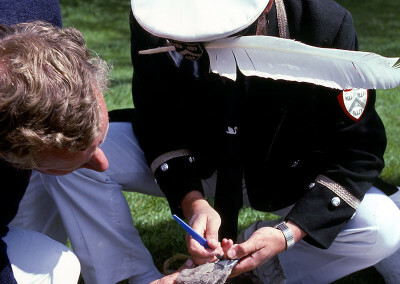 On the left arm of the coat is a badge with a swan and the words round it “Her Majesty’s Swan Keeper”. 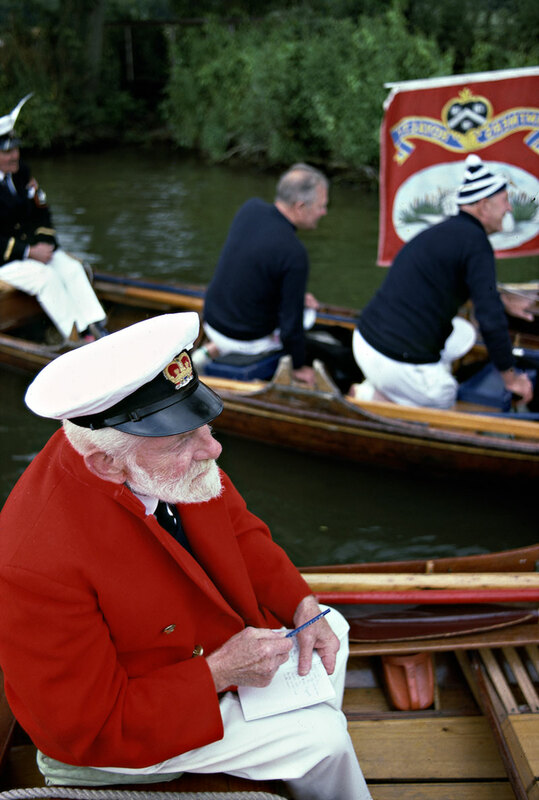 The Queen’s Swan Uppers are dressed in scarlet jerseys and withe duck trousers. 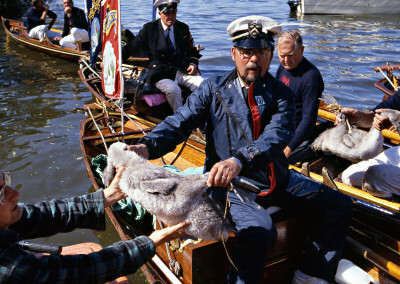 The Dyers’ Swan Master wears a blue coat with gold braid and brass buttons, a peaked cap with a white cover and white trousers. 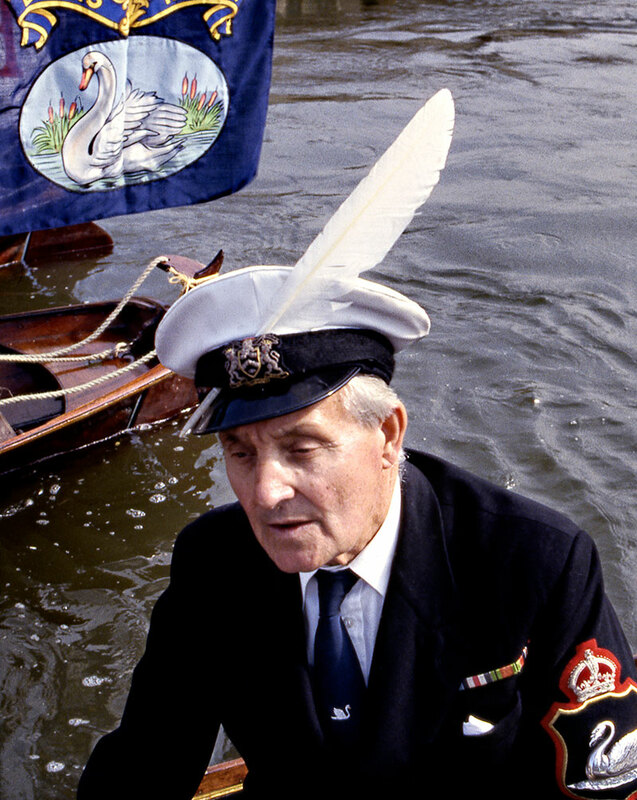 His cap and jacket badges bear the Company’s arms. 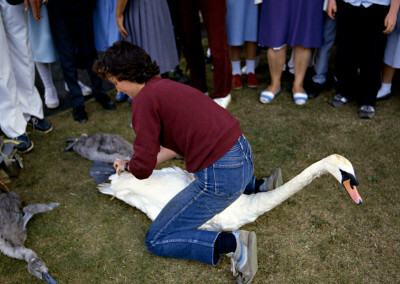 The Dyers’ Swan Uppers wear blue jerseys and white trousers. 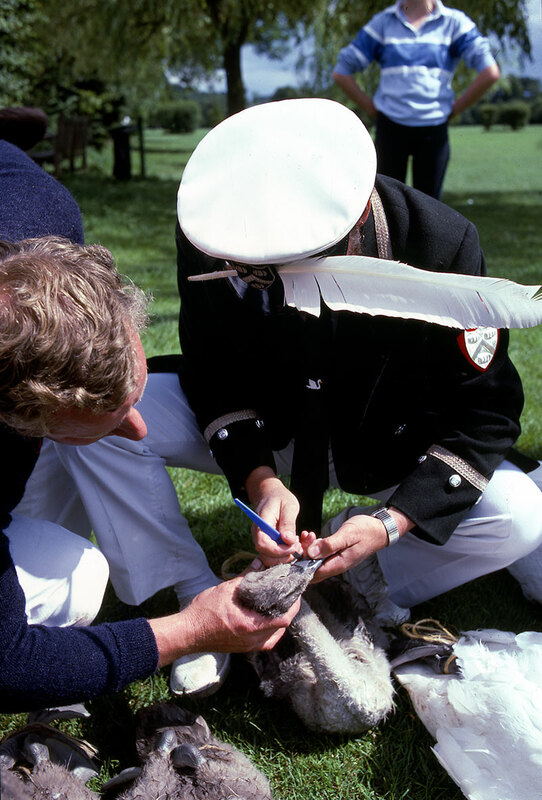 The Vintners’ Swan Master wears a green coat with silver braid and buttons and a peaked cap with a white cover and white trousers. The badge on the cap and jacket also bear the arms of his Company. 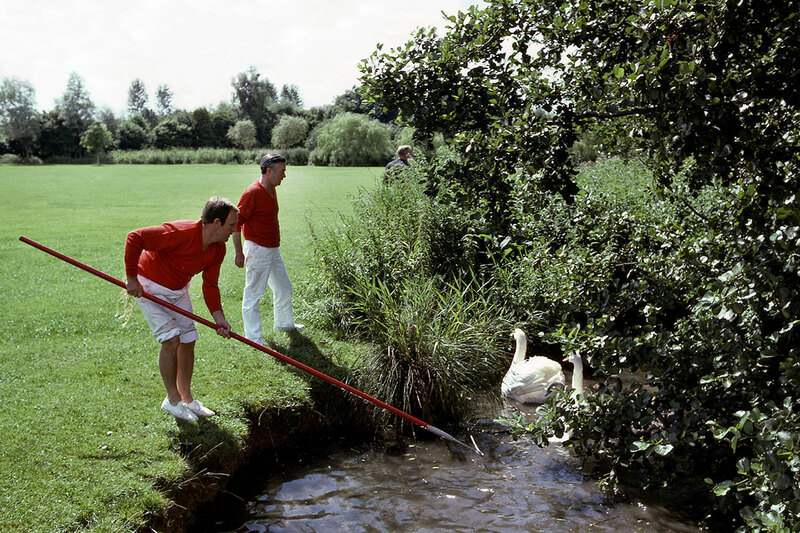 The Vintners’ Swan Uppers wear white jerseys and white trousers. 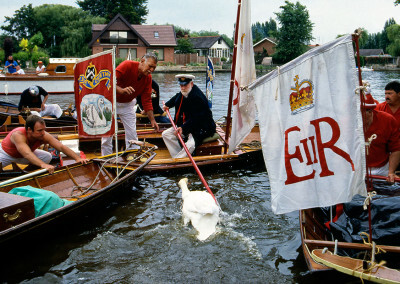 The boats have special flags: the Queen’s boats have a white flag with the Royal Crown superimposed on the Royal Cypher: E. R. II. 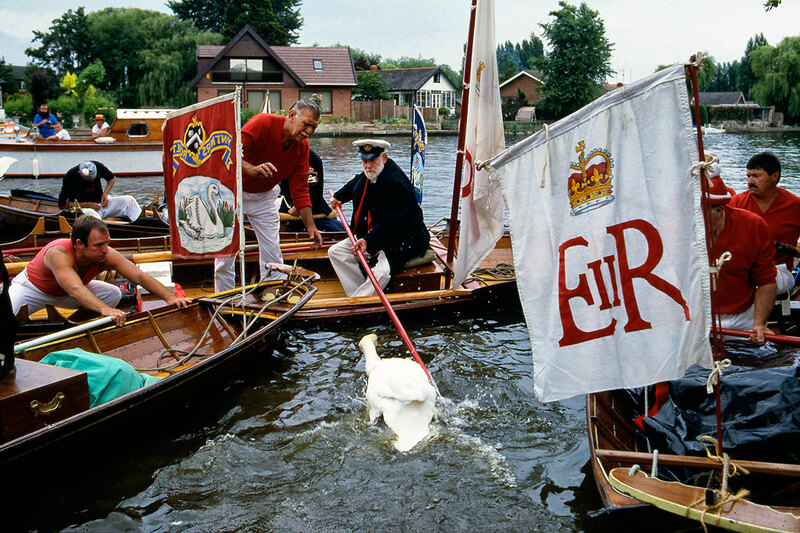 The Vintners’ flags have a swan on a red background, underneath the Arms of the Company and the motto: “Vintners Royalty”. The Dyers’ flags are blue with a swan and the Company’s badge in one corner. 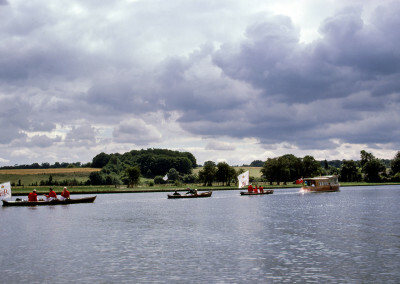 The voyage lasts a week and goes from Sunbury on Thames up to Pangbourne through Egham, Staines, Windsor, Maidenhead, Marlow, Henley, Wargrave, Sonnin and Reading. 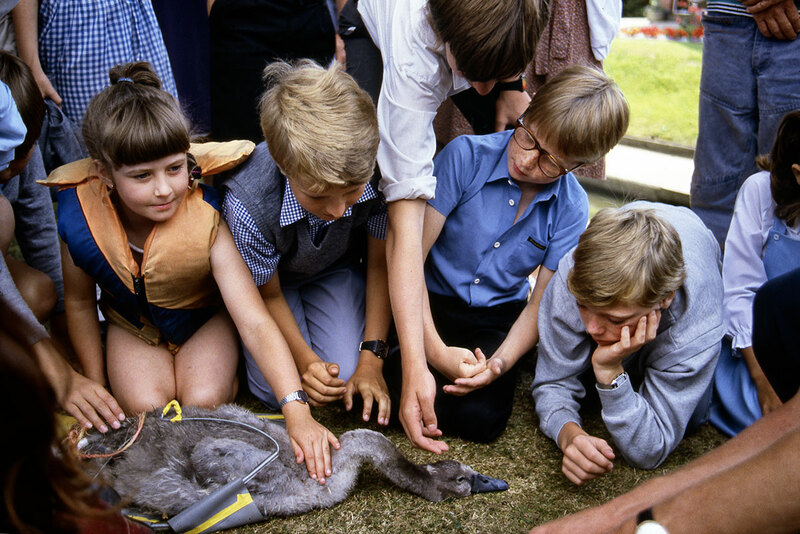 The various broods are rounded up and catched, the swans counted, the cygnets counted and marked appropriately according to the parents’ mark. The Royal birds are no longer marked since Queen Alexandra deemed it a somewhat crude treatment but the Dyers mantain a very simple mark, a single nick in the beak and the Vintners two small nicks one on each side of the beak. 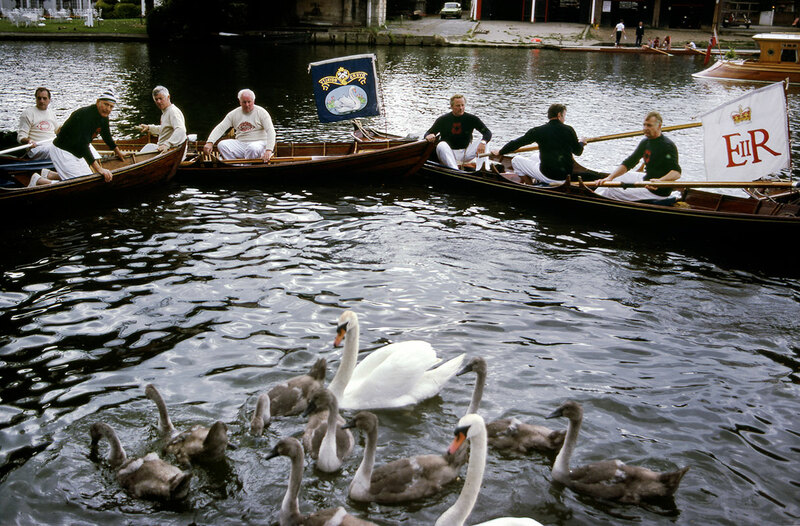 The cygnets of a mixed couple (Dyers-Vintner, Queen-Dyers) are equally divided and each one more is marked the same as the father’s. 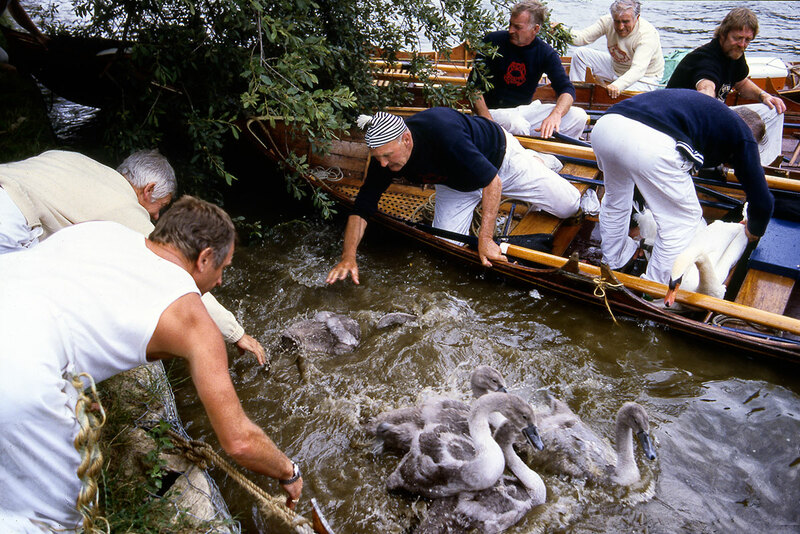 The care to the swans is given during all year, infact each Swan Master is responsable for a stretch of the river and he is called whenever an animal is in danger or sick. 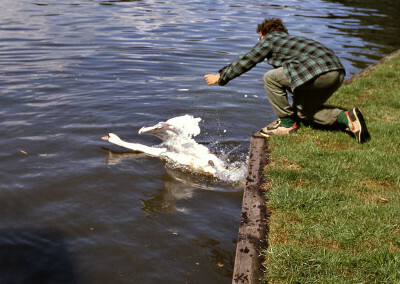 Nowdays there are many risks for the river’s animals’ health, the main one is pollution. 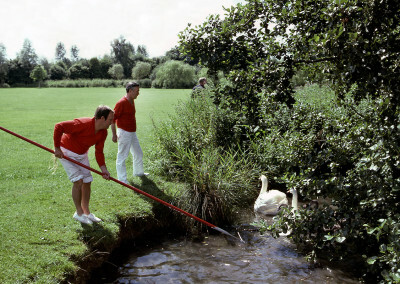 That’s why in the last 6 years the cerimony has gained an extra scientific importance: the Oxford University Zoology faculty sends a team of students led by Doctor Perrins to check up the general state of health of the swans with blood tests, weight control, etc. Back to the skiffs wake which rhythmically move forward at a respectful distance one from the other, the first swan’s family is sighted behind a little island. Captain Turk lifts up one arm and shouts: “All up”. 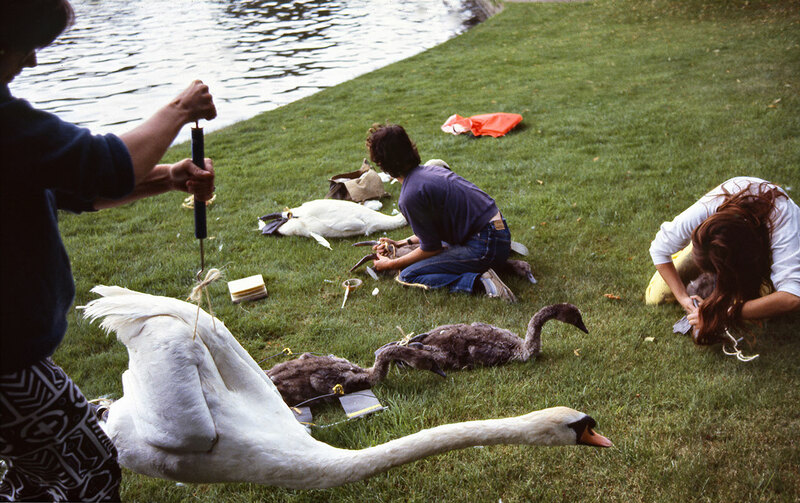 The Swan Uppers row faster and in a twinkling of an eye the swans are surrounded and caught one by one. 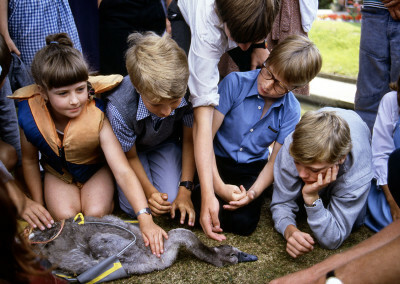 Recognised the swans parents marks the cygnet can be marked, passed over to the students for the exams and finally set free again. The convoy sails off again. It’s hot day. On the way there are several dams for the water difference in level, so the Swan Uppers allow themselves a drink, according to the tradition: rum and milk. On the riversides people are waiting for them, every year is like the same fairytale, on and on again. On the river, motorboats have gathered to follow up the convoy and sometimes one drags all of them along with a rope. 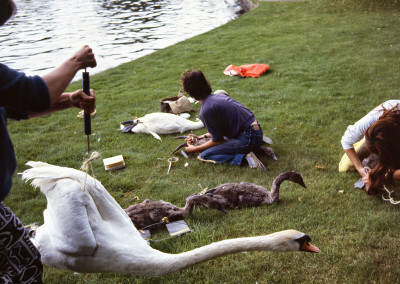 But there is another swans’ family. “All up”. 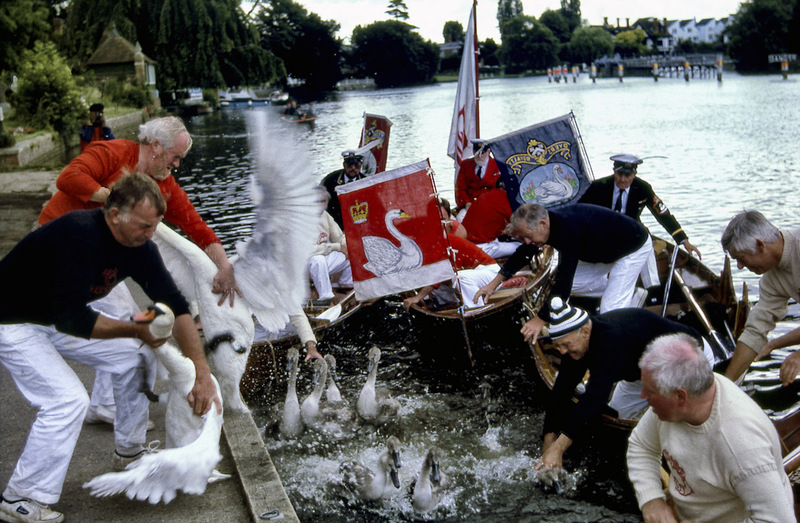 Thanking the lift from the motorboat the Swan Uppers grasp the sculls and row resolutely towards them. 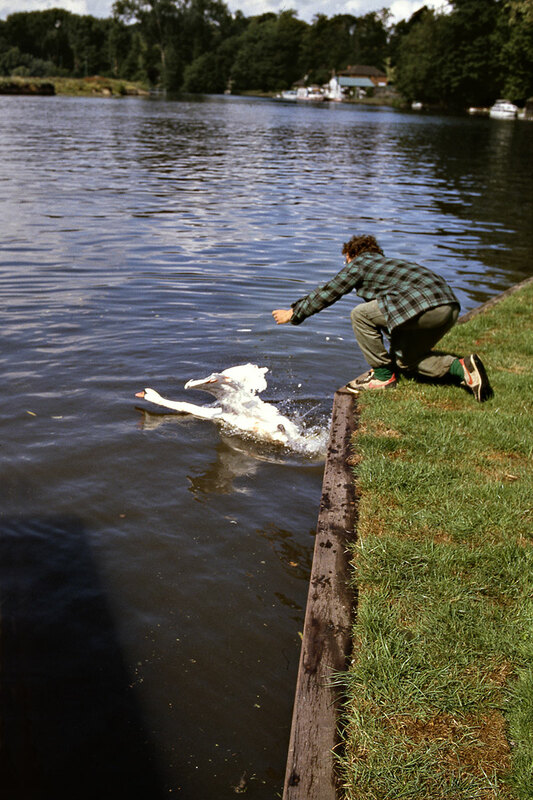 They set the skiffs in a triangle, rounding the swans up, the water ripples, the swans toss and turn, the boats bump along and finally, after a lively scrimmage, the Swan Uppers catch the swans but mother swan has escaped and from a safe distance she calls. Captain Turk then with great ability and a long hook clasps her neck and drags her on board without hurting her. 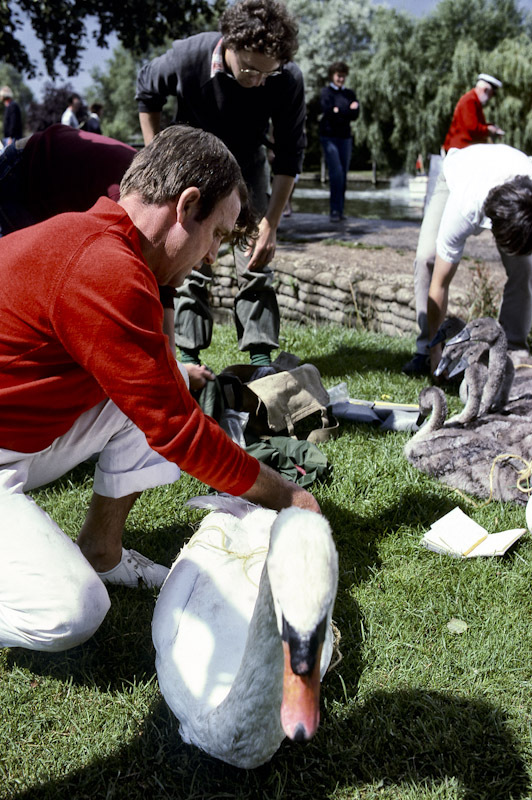 The whole family has been caught, the cygnets can be claimed and the convoy can sail on again.